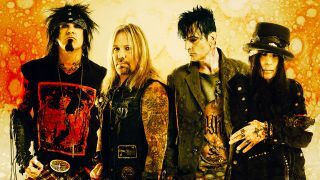 Motley Crue’s biopic The Dirt arrived on Netflix just two weeks ago, and it’s catapulted the band back into the spotlight. Sales, streams and downloads of the Crue’s catalogue have soared in the last 14 days, while the soundtrack to the film went in at no.10 in the Billboard 200 chart – the band's first top ten since 2008 album Saints Of Los Angeles. And while fans have been listening to classic Motley Crue cuts, it appears they’re also devouring the book the film is based on: 2001’s The Dirt: Confessions Of The World’s Most Notorious Rock Band, written by Neil Strauss. It’s re-entered the New York Times bestsellers list at no. 6 in the paperback non-fiction charts and at no. 8 in the combined print and e-book non-fiction list – 18 years after it was first published. The book has also hit the top spot on several Amazon charts. Senior vice president and publisher at Dey Street Books/ HarperCollins Lynn Grady says: “The Dirt by Neil Strauss and Motley Crue is a rock masterpiece. “It’s been so great to see how both the book and the movie have worked together to inspire so much interest in the band’s music and their singular and remarkable story. The first hardback edition of The Dirt stayed in the New York Times bestseller list for four weeks when it was first published. Here's everything you need to know about the film.